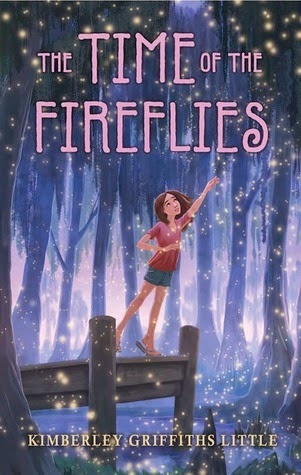 In The Time of the Fireflies, Kimberley Griffiths Little has created a beautiful story of connection, loss, tragedy and redemption across several generations of family. Larissa Renaud's family is hurting. Her mother, tired, stressed, and constantly on edge, is pregnant and second-guessing their choice to move back to her hometown in Bayou Bridge, Louisiana. Their antiques business is struggling. They've had a hard time fitting in and finding their place. A year earlier, Larissa was badly injured in an accident on an old, disintegrating bridge and was left with an angry scar on her face and an angry heart toward the kids that she blamed for the accident. Nothing is going right. And then Larissa makes a remarkable discovery. With the help of a swarm of fireflies, she's able to travel back in time and see the chain of events that has saddled her family with a dark curse as well as some of the earlier tragedies that still affect her mother and grandmother. I appreciated the character development and settings, though the characters' accents (mostly bad grammar) seemed to come in and out a bit. The "flashbacks" to earlier times were fascinating and a great tool for moving the story forward, though occasionally they were a little confusing as they were out of order sometimes. I also found myself wishing that - without giving away the ending - the resolution of the curse had more to do with what ended up being the coda rather than the more supernatural path it took. Again good, uplifting messages about looking for the positive and not making assumptions about others. Also, the corrosive effect of hatred on oneself is highlighted and the message that "it's never too late" to apologize or to forgive is a constant theme running through the story.